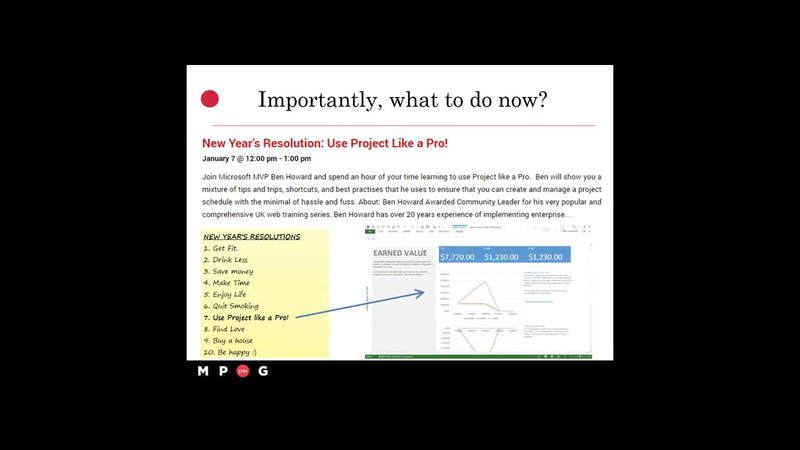 Webinar: New Year's Resolution: Use Project Like a Pro! Webinar: New Year’s Resolution: Use Project Like a Pro! This webinar is eligible for 1 Category A PMI® PDUs in the Technical Project Management talent triangle category. If you are claiming this session, you must submit it to your MPUG Webinar History after it has been completed in its entirety. Join Microsoft MVP Ben Howard and spend an hour of your time learning to use Project like a Pro. Ben will show you a mixture of tips and tricks, shortcuts, and best practices that he uses to ensure that you can create and manage a project schedule with the minimal of hassle and fuss. Awarded Community Leader for his very popular and comprehensive UK web training series. Ben Howard has over 20 years experience of implementing enterprise solutions such as MRPII, ERP, and latterly Microsoft’s EPM (Project and Project Server) solution. During that time he’s worked for IBM, DELL, and Microsoft, as well as several smaller organisations. He now runs his own EPM consultancy (Applepark Ltd), providing Project Server implementation and training services. His has been awarded the Microsoft Most Value Professional award for Project for the last 5 years, and has published the successful “Microsoft Project 2013 Plain and Simple” book. Well, I tried downloading the media player suggested and it wouldn’t play the file, nor would installing the codec. Any more thoughts?